Spektrum believes you should expect more from a 7-channel transmitter and the DX7s is proof. Besides advanced DSM2®/DSMX® technology and an impressive list of programming features, it boasts the finest ergonomics in its class. Its balanced weight, silky smooth quad-bearing gimbals and rubber grips provide a sense of comfort and precision that is second to none. 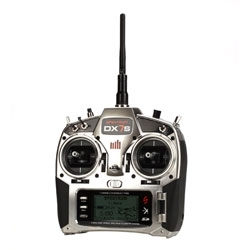 The DX7 also features the situational awareness of built-in telemetry, the intuitive SimpleScroll™ programming interface and the clarity of a large LCD screen. And you'll always be up to date with the latest Spektrum™ AirWare™ software thanks to the SD card Spektrum Data Interface.